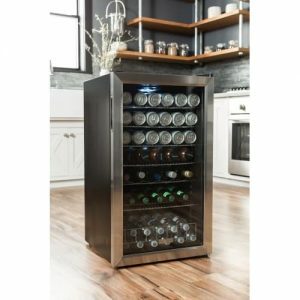 Stainless steel EdgeStar BWC120SSLT is a large capacity and very low-temperature beverage cooler with a standalone design for a total of 5 regular sized wine bottles and 103 cans. It is rated 4.1 out of 5 stars and there are some 60 customer reviews and ratings at the moment on Amazon.com. EdgeStar Beverage Center has a new technology powerful compressor (85W and 115V/60Hz) and a fan that helps keep the even temperatures inside. You can expect temperatures between 32 to 55-56 degrees Fahrenheit, depending on what you set it to. It is actually promoted as the coldest beverage cooler available on the market. And you will be able to keep your beer, wine, soda and water cans and bottles at the coolest temperatures possible without freezing. The glass door is stainless steel trim tempered and reversible so you can choose to install it to open from the left or the right, whichever is convenient for you. It can only be used as a standalone- freestanding cooler but not as a built-in one because it needs a bit of clearance on the sides (two to three inches) and the back (three to four inches) for proper ventilation. So please do not put this fridge in an enclosed space or the compressor will work harder constantly and last much shorter. Black and stainless steel EdgeStar Cooler weighs 64 pounds and measures 33 x 19 x 18.25 inches and you get a bit of space inside- 28.75 x 15.5 x 14.25 inches. It has a 3.6 cubic foot capacity of up to 103 standard 12 oz. cans and 5 x 750ml bottles. It looks sleek, modern and stylish with the removable chrome shelves, interior blue LED lighting and a stainless steel front. You will also keep your bottles and wines safe thanks to the integrated lock at the bottom. You’ll find six detachable chrome shelves that slide out easily for your cans and bottles. And you have an extra space in the bottom of the cabinet that actually lets you fit in up to 28 cans but does not pull out. The bottom section and the lower shelves tend to be cooler than the upper shelves but it is quite cold overall so you don’t need to worry about that. The shelves are removable and adjustable for you to accommodate your larger or taller cans and bottles. 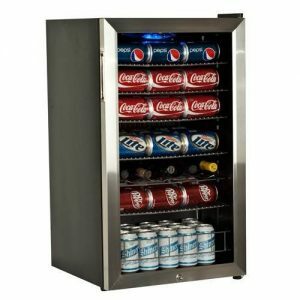 The manufacturer claims that other beverage coolers simply can not reach the low temperatures that you’ll experience with this one. There is no digital display panel at the front of this unit but the manual temp controls, as well as the manual defrost function. Whether you want to put the cans vertically or horizontally (stand up or lay on the side) is up to you, as the shelves are adjustable and removable. It is not an Energy Star compliant fridge because of the glass door that is not as insulating as a solid metal door to block the outside temperature. That’s another reason for using this unit only indoors and not outdoors- it is an indoor beverage cooler. It runs rather quietly and you will only hear a slight hum when there is zero noise in the room. Great value cooler overall!